Talking about a city trip to Spain, most people think about Barcelona. But Spain has another beautiful city near the coast. Valencia is about 400 km further south of Barcelona and is gaining popularity. I have put together the perfect guide to make the most of your visit. 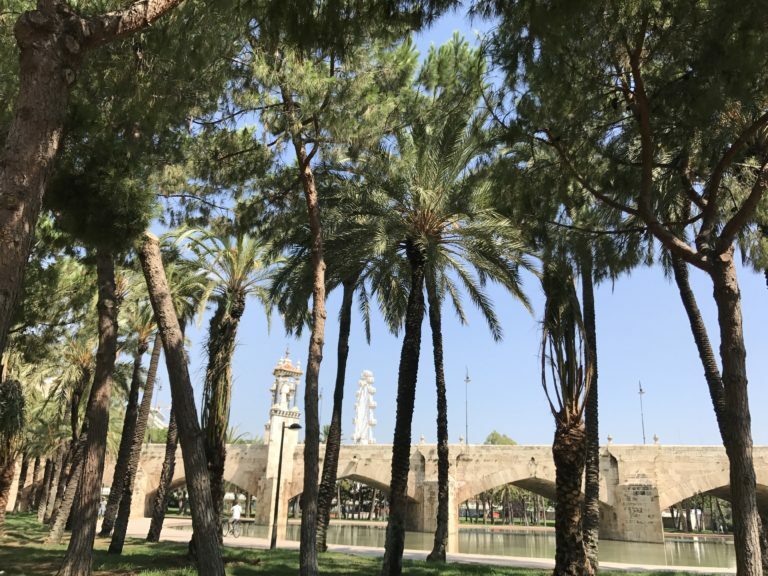 My Valencia Spain travel guide includes the best things to do, where to eat and where to stay in Valencia. Valencia has a wide range of hotels, from cheap to extremely expensive. If you would like to escape the city center in the evening, you can book a nice hotel near the beach. Las Arenas Balneario Resort is top of the bill, but if you are looking for something more affordable, I can recommend Hotel Neptuno. RELATED – Planning a trip to Spain soon? 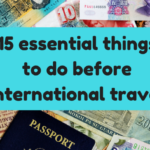 Make sure to check out our Europe Packing List for all the travel essentials for Europe. This square, is the city center, is named after Queen Mary de las Mercedes de Orleans, the first wife of King Alfonso XII. In the corner of the square you can find the main entrance of the Cathedral of Valencia. Built in the 13th century, but expanded regularly during the next the centuries. The main entrance has a beautiful 18th century baroque gate, Puerta de los Hierros. According to the legend, the holy grail should be preserved here. You can climb the bell tower for an amazing view. At the other side of the cathedral, you enter plaza del Virgen. 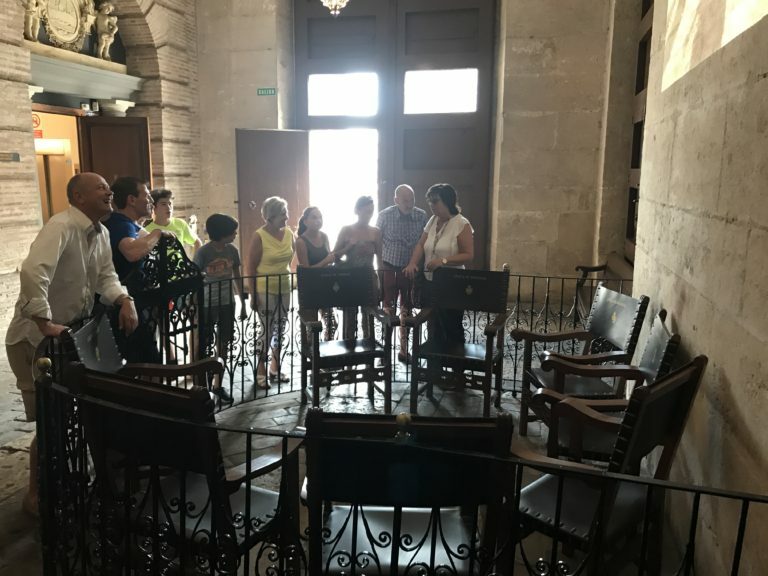 Over here you can enter Puerta de los Apostoles, home to a unique courtroom. Every Thursday afternoon the so-called Water Courts meets over here. This court settles disputes between farmers about water distribution and irrigation in a few minutes. No long-term lawsuits, but quick decisions. The seats on which the judges are sitting are in the entrance. The Water Court is on UNESCO’s Immigration and Cultural Heritage List. This is one of the most beautiful Gothic buildings in Europe and a Unesco World Heritage site since 1996. It was originally build for trading in silk and it has always been a centre for commerce. The Market Tribunal and the first Spanish court also resided here. The turret was a prison. Traders who could not afford to pay their debts were locked there until their family paid for them. This is Europe’s largest indoor fresh market at over 8,000 square meters. This historic masterpiece was inaugurated in 1928. 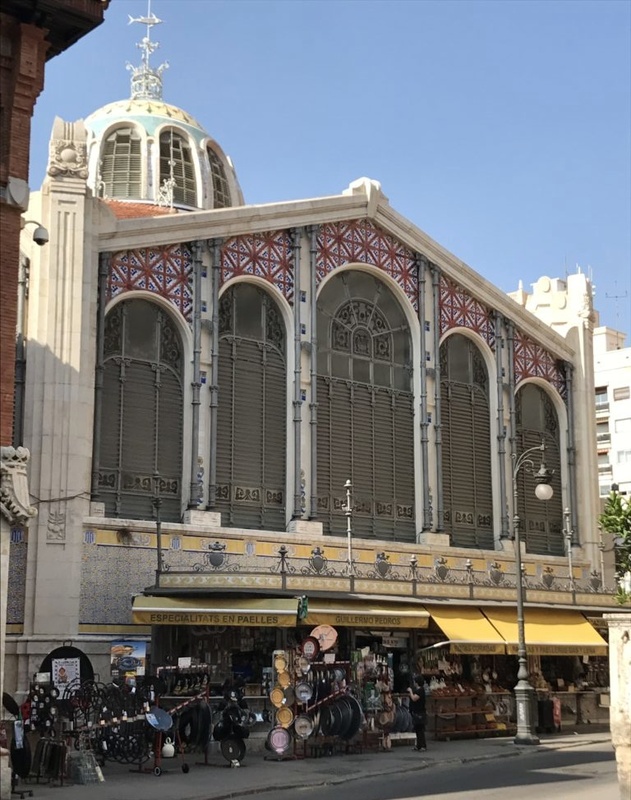 The Art Nouveau building, with its beautiful glass roof, is home to more than 1,000 selling posts. It’s best to go in the morning, because they close at about 14.30h. 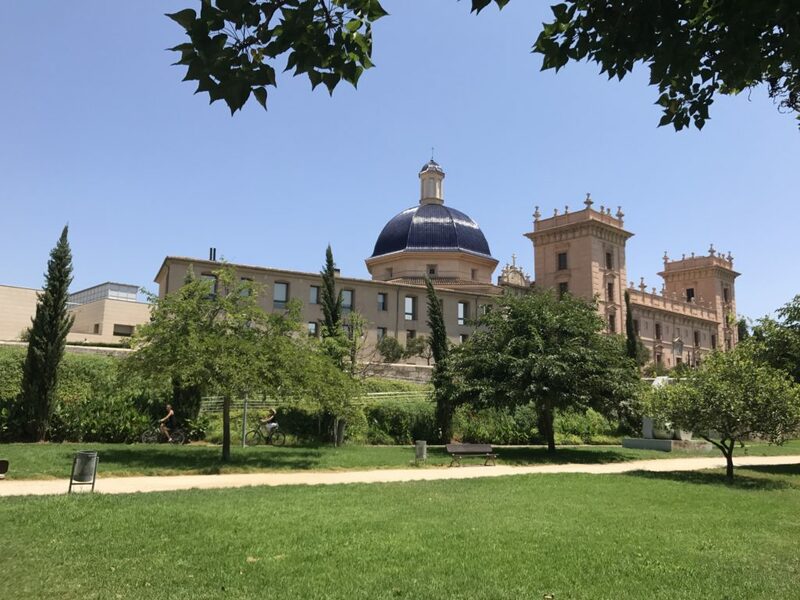 At the back of the cathedral you will find the El Museo Arqueológico de l’Almoina. There is a glass floor in front of the entrance of the museum, giving you a glimpse of the excavations. 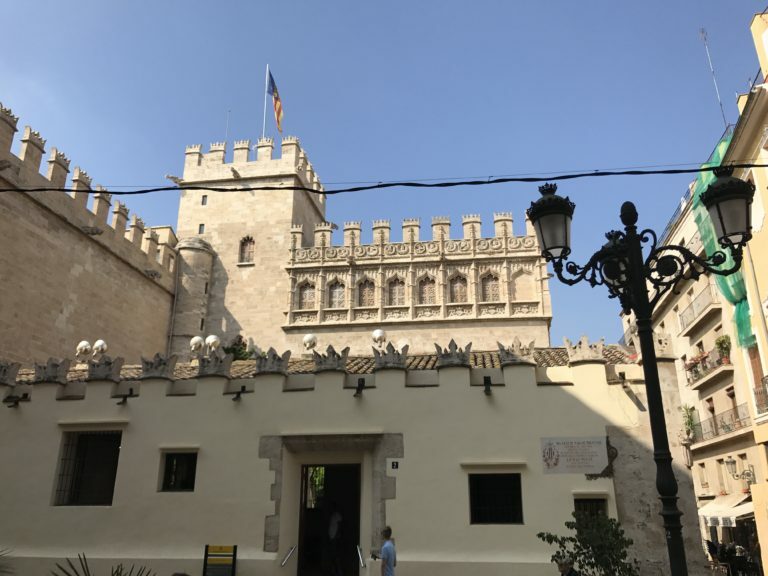 This former palace of the Marques de Dos Aguas is one of Valencia’s most beautiful buildings and houses the National Ceramics Museum. Turia River used to cross the city. Due to the many floods they decided to change the crossing of the river. It now is a green strip through the city with sports fields, zoos, bike paths and hiking trails. This is the place to see the locals jogging, walking their dogs or just enjoying a quiet afternoon. Traveling with children? Don’t miss the Gulliver playground. The giant from the same story is tied to the ground. The children who play upon him look like lilliputters. On the way you pass some beautiful bridges like the Puente del Mar and the flower bridge. The Palau de la Musica, Valencia’s Concert Hall is also located here. The Palau de les Arts Reina Sofia, designed by Santiago Calatrava, is the 2nd ultra modern opera house ever built following the following the Opera House in Sydney. With its height of 75 meters, it is Europe’s largest opera house. L’Hemisferic (eye of wisdom) contains an IMAX cinema and a planetarium. Museo de las Ciencies resembles the skeleton of a whale. It is an interactive science museum. Children will especially love it. The Museo de Bellas Artes is one of the most important museums of modern art in Europe. You can enter for free, yet it attracts few visitors. Not into art? Enjoy the beautiful exterior. This 15th century city gate was recently restored. The bullet holes, caused by Napoleon ‘s army, are still there and are now nesting places for the many parrots. Climb the towers to enjoy a nice view. 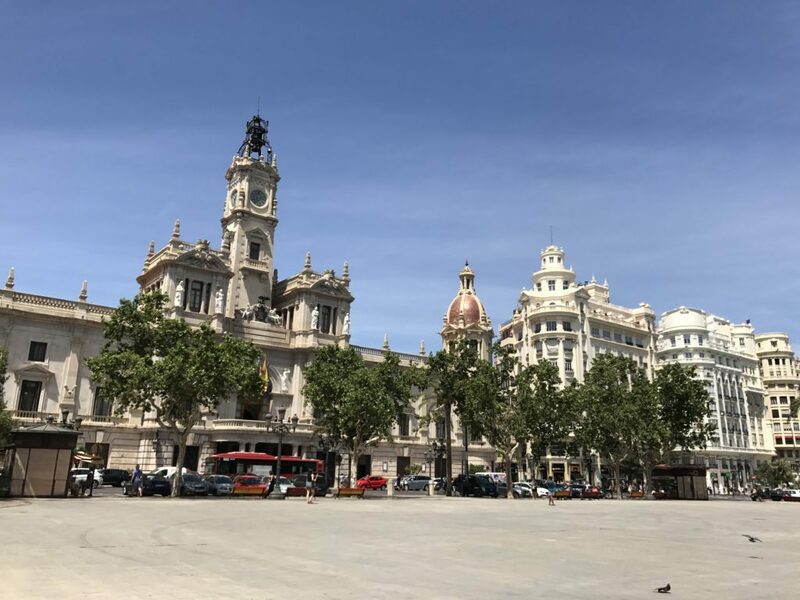 This giant square is dominated by the city hall Ayuntamiento and the post office Correos. LaLola. Located in a small alley next to the cathedral. They serve local specialties. Their paella was not really the best we tasted, but their entrees (gazpacho, delicious ham and squid) were delicious. Mediterranea de Hamburguesas.Has the best burgers in town and is situated close to Mercado Central. La Pepica. Has been serving paella since 1898. Hemingway, the Spanish royal couple and many celebrities have dined here. The grilled squid is divine and the paella’s are nice too. El Coso. I loved the Tellinas (Vongole) a la Plancha. Panorama. Great food and a beautiful scenery. There are terraces, but you can enjoy the view from the inside too thanks to the glass walls. Mixed feelings over here. For a few of us it was divine, others were disappointed. Nevertheless, I highly recommend the smoked sardines, tuna & avocado tartare and the Arroz de Marisco. Arroceria Duna Located a quarter of a mile outside the city at the beach. It is beautifully decorated and you have a magnificent view. The cargo ships lying here on the coast, look like they came out of a fairytale. The paella is delicious. 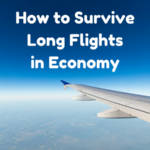 If you leave from a European country, there are many low cost airlines that fly to Valencia. It takes about 15 minutes to get from the airport to the city center. The best way to discover Valencia is by bike. You can rent a bike and discover the city on your own. We booked a trip with a guide for the first day. This way we got a good impression of the city in a short period of time. The next days we could explore Valencia further on our own. We booked a bike ride at Tours in Valencia. Suzie, the owner, is Flemish who lost her heart in Spain. Her colleague Petra was our enthusiastic guide. At 10 o’clock we met at Plaza de la Reina. Around the corner we picked up our bikes and we were ready to explore the city. At every major point of interest and every cozy place, Petra stopped for a short explanation and to give us time to take some pictures. Many restaurants are closed and Sundays. Many museums and churches are closed on Mondays. Totally in love with Spain? You must visit Barcelona. Read this post to learn all about Barcelona. 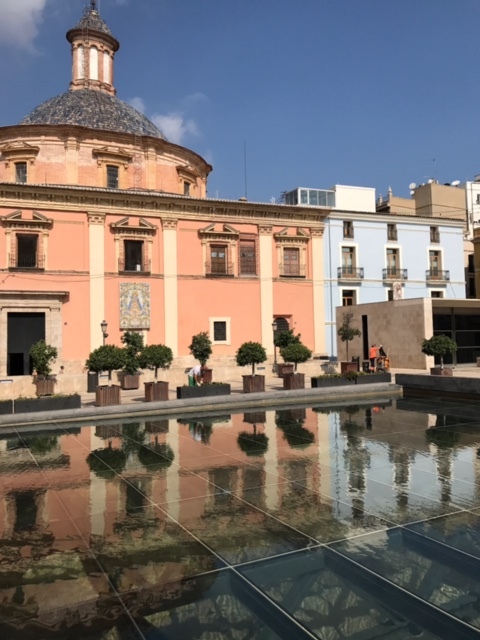 These are my top choices for the best things to do in Valencia. 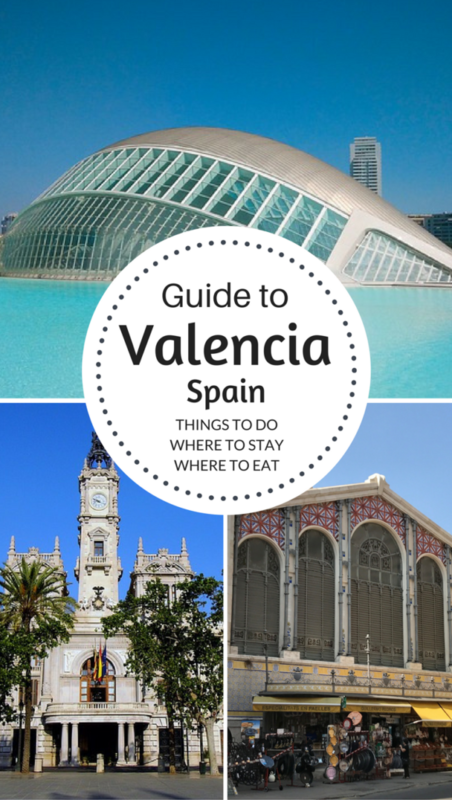 Have you visited Valencia? If so what would you recommend first time visitors see? Wendy is a Belgian travel blogger, foodie and bon vivant. You can follow her adventures on her website Worldwidewendy, Instagram, Pinterest, Twitter and Facebook. Disclaimer: This article contains affiliate links. I may make a small commission if you make a booking using my links at no additional cost to you which helps pay for the running of this blog. 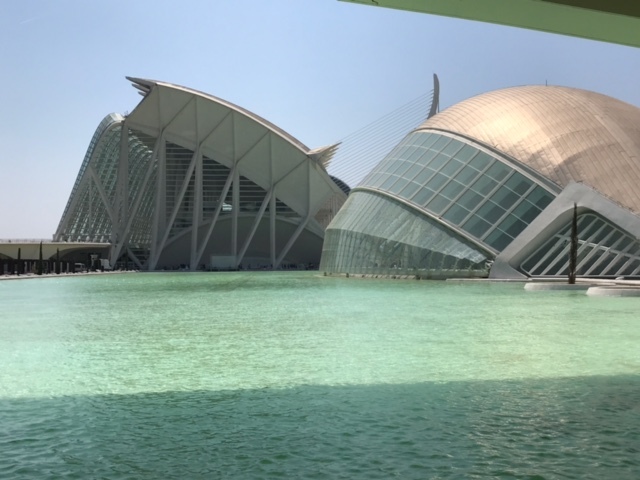 Valencia is beautiful! I cannot wait to get there and see these sights for myself! It was good to learn what days the restaurants, museum and churches are typically closed! We loved Spain but did not make it to Valencia. We didn’t get to Barcelona either and I wanted to see that, too! Our next trip we’ll have to see the spots we missed. This really helps with my planning for sure! We always take the kids and they would love it, too. The oranges in Valencia were the tastiest I have had in the world. Fresh squeezed orange juice there is amazing. Love Valencia! Such a lovely city and there is so much to do!